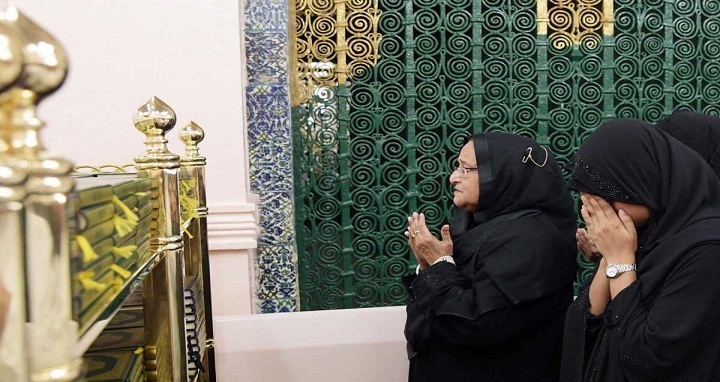 Dhaka, 18 October, Abnews: Prime Minister Sheikh Hasina offered ziarat at the Rawza Mubarak of Prophet Hazrat Muhammad (PBUH) at Masjid Al-Nabawi here on Wednesday night. She offered Esha prayers at the holy mosque and sought divine blessings for the people of Bangladesh as well as peace and prosperity of the entire Muslim Ummah. Earlier Wednesday night, the Prime Minister arrived at Medina from Riyadh by a special flight of Saudi Arabian Airlines. She will leave Madina for Jeddah on Thursday morning and lay the foundation stone of the Chancery Building of Bangladesh Consulate General in Jeddah. The Prime Minister will perform holy Umrah in Makkah after Esha prayers on Thursday night. On Tuesday, Sheikh Hasina arrived at Riyadh on Tuesday on a four-day bilateral visit to Saudi Arabia at the invitation of Saudi King and the custodian of the two holy Mosques Salman Bin Abdulaziz Al Saud. During her stay in Riyadh, the Prime Minister had meetings with the Saudi King and the Crown Prince and Deputy Prime Minister Muhammad bin Salman bin Abdulaziz Al Saud. She also had a meeting meeting with the Saudi business community, including leaders of the Council of Saudi Chamber (CSC) and Riyadh Chamber of Commerce there.